If you make the rounds of the food blogs over the next few days, I’m sure you’ll notice something strange: lots of banana splits. The reason? Foodbuzz is sponsoring a posting challenge and “Top Nine Takeover” to raise money for the Ovarian Cancer Research Fund (OCRF). For every Featured Publisher that constructs a post around the theme “The Ultimate Banana Split”, Foodbuzz will donate $50 (up to $5000) to the OCRF. Now I’m not one to indulge in something like a banana split all that often (and I certainly wouldn’t blog about it if I did! ), but my grandmother died of ovarian cancer, so you can bet I support this cause. 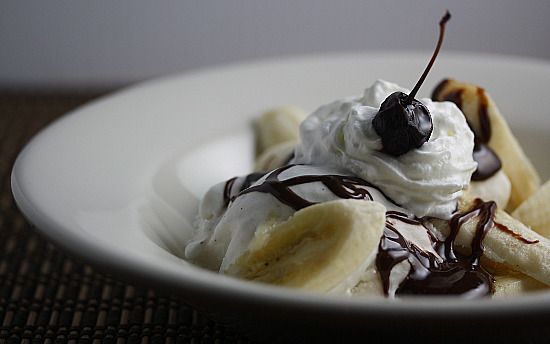 So above is my ultimate banana split, made with sliced bananas, homemade organic vanilla bean ice cream (recipe below), hot fudge, whipped cream and a real cherry…I don’t do maraschinos! 1. Combine all ingredients in a blender and process until smooth. Refrigerate for at least 1 hour. 2. Freeze in your ice-cream maker according to the manufacturer’s instructions. I know you probably want to go grab a real banana split right now, but before you do, head over to Kelly Confidential and build a virtual one! For each virtual banana split you make (1 per day), Electrolux will donate $1 to OCRF on your behalf (plus you’ll be entered to win some great prizes)! Great dessert for a great cause! What a wonderful cause…my grandmother fought Ovarian cancer and has been in remission for 5 years. I wish I hadn’t been traveling this week…I would have loved to participate. Thanks for your work! The fresh cherry on top makes the banana split all the more healthy. Well done! I’m impressed at how easy that recipe is! I’ve made a lot of ice cream, but never just pure vanilla. Ohhh, that ice cream sounds so rich and decadent. I thimk I need some!